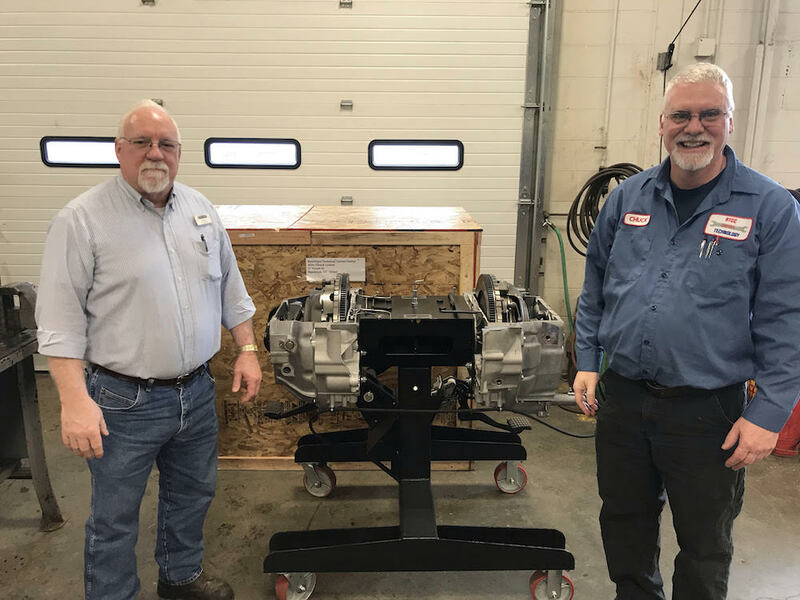 The Diesel Technology program at Randolph Technical Career Center may be small – and a lot of the students like it that way – but it consistently produces big results. With just five students enrolled during the 2017-18 school year, the class racked up 57 online training certifications and came in 71st out of 184 schools nationwide. That kind of commitment, dedication, and production continues to get the attention of Freightliner of New Hampshire, which has agreed once again to be the program’s sponsoring dealer. And because of that relationship, and the consistently hard work of students in the program, the class was recently able to purchase a “dual clutch” training simulator at half price. Now - not a lot of us (will ever) understand what a dual clutch simulator is (ok, it’s a training device that has a hydraulic clutch on one side and a mechanical clutch on the other); nor are we likely to understand why that’s important. But to the students in the Diesel Technology program, it means yet another opportunity to learn current diesel technology; and another opportunity to partner with one of the best Freightliner outfits in the country. We are grateful for our partnership with Freightliner of NH; and proud of the work our students are doing – year after year. The human brain remains an unsolved mystery in science. Technology now allows scientists to take pictures of the billions of cells that make up the brain and to see when the cells are working and how the cells change. “Scientists used to think that human brain development was pretty complete by age 10, that a teenage brain was just an adult brain with fewer miles on it.” How does the brain change during adolescence? What does the teenage brain need to grow and thrive? While there is much we do not know about the brain, some things are increasingly clear. High school is an essential time for brain development influenced by sleep, stress, and many other factors. RU and RTCC students in "The Learning Brain" PBL have been spending time examining and analyzing the mysteries of the human brain this fall, as well as developing a video to showcase their work. The students interviewed peers and teachers about learning, analyzed the data, and edited a video to capture the highlights. Members of the class include Logan Ballou, Zach Bingham, Riley Browder, Alliyah Gartner, Angel Gaulin, Emily Kelley, Bri McLlarky, Sam Pickett, Alexia Russell, Kaylee Thayer, and Ada White." Story and photo by Zoë Newmarco, courtesy of The Herald, Nov 18, 2018. A panel of construction workers from Engelberth Construction, Inc., of Colchester, and a mechanical engineer from Vermont Heating and Ventilation Company of Winooski addressed students studying building trades and construction management at Randolph Technical Career Center, on Friday. Six out of seven panelists were women, however they were quick to acknowledge that at Engelberth only 17 of 150 employees are female. Director of Human Resources Gina Catanzarita said that of those 17, none are in leadership positions in the field. She’s hopeful that will change as more young women begin to pursue careers in the construction. Construction Management instructor Tim Murphy noted that currently six of fourteen (40%) of his students are female—the highest percentage of young women ever enrolled in his class. Murphy pointed out that he had put together the day’s panel with an eye toward inspiring the young women in his class. The panelists held a variety of construction-related job titles, including field worker, estimator, director of safety and training, and CFO, and came from a variety of professional backgrounds. “I went to high school, same as you guys did, to a tech school,” said Michelle Lussier, an estimator at Engelberth. Lussier noted that she didn’t pursue a college degree, but rather learned many of her skills on the job—first at a plastics company, and eventually at Engelberth. Mallory Fischer, of VHV, studied architectural engineering at Vermont Technical College. Her interest in construction stemmed from working on construction projects with her grandfather throughout her childhood. Students asked many questions, on topics ranging from the kind of qualifications they would need to work for a commercial construction company, to what sort of harassment or discrimination employees experience in the workplace. Alison Lamagna of Vermont Works for Women and Jay Ramsey, the state’s director of technical career education, came to ask the panel questions as well. They prompted discussion on topics such as maternity leave options for construction workers, and how technology changes the field. Lamagna asked female students what had drawn them to the building trades class, to gauge how construction companies can begin to attract more young women. “I’ve always known that I wanted to do some sort of trade … that I wanted to work with my hands,” shared Em Scherbatskoy. Murphy gave each panelist a wooden cutting board, handmade by the students. He noted that the cutting boards required each student to work in a team, to use 12 different tools, and to identify several different types of wood. Before the course is over, he added, the students will use those same skills to build furniture. Diversified AG - What's THAT all about? Ever wonder what students in"Diversified Agriculture" do? Aren't they really just studying to be farmers? Maybe it's time to take a second look at what's going on in today's Ag industry. It's more than you might ever have imagined! Take a moment and view this quick slideshow, developed and presented by students at a recent Diversified Ag Challenge Day. What (and Who) is Diversified AG? Randolph Technical Career Center (RTCC) hosted its second annual “Opportunity Fest” last Friday, showcasing local employers and highlighting professional opportunities for high school students or soon-to-be graduates. Jason Finley, RTCC’s work-based learning coordinator, noted that last year the format of the Opportunity Fest had been comparable to a typical job fair, but that this year the school had organized several panels with professionals from many local businesses. “We wanted to encourage more dialogue between professionals and students,” Finley explained. Students were encouraged to attend at least two of the six available panels, which covered topics including farm businesses, working with people, and transportation systems. “The necessity of being able to successfully navigate the technology that’s pertinent to your field isn’t news, but it’s so important it’s worth reiterating,” said Chris Dutton, a dairy farmer and former chair of Vermont Technical College’s dairy management program. Dutton’s sentiment was echoed throughout the panels, regardless of the profession under discussion. Each panel was moderated by an RTCC staff or faculty member, and panelists talked about opportunities for internships or entry level positions in their industries, as well as skills looked for by employers. Finley mentioned that next year all students will be required to shadow a professional in the field they’re interested in, and that the Opportunity Fest was intended to be a networking opportunity for students, as well as an inspiration to them. 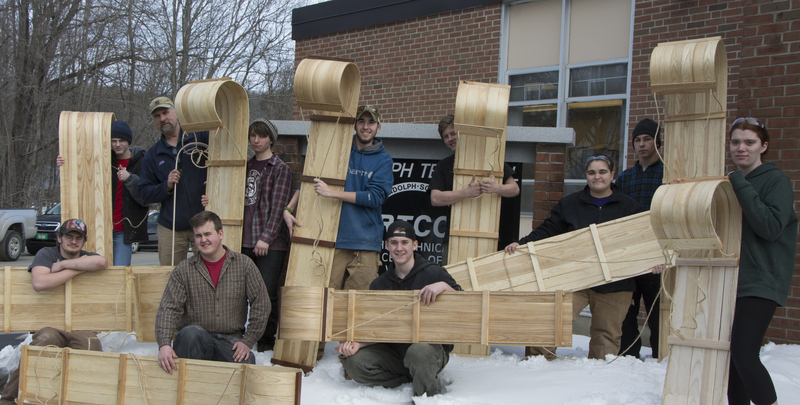 Students in the Construction Trades program came up with something unusual and just right for the season recently: toboggans. Students built th forms the steamer and milled materials from rough stock purhasd from Don Carbino of South Royalton. Through the process, the class studied methods of steaming wood, working in teams to produce 11 new sleds. "This is the first time we have covered "steaming", which involves changing the cell structures in wood said Program Director Tim Murphy. "We had our challenges, but we were successful." Construction Trades students have now turned their attention and focus to a furniture builidng unit, and later this spring, will cut a timber frame in the shop.